The Museum of the American Revolution recently opened just a few blocks from Philadelphia’s historic Independence Hall. The new red brick building boasts 32,000 square feet of galleries and theaters winding around a central atrium. Immersive exhibits, engaging films, and an iconic collection of artifacts bring to life the events, people, and ideals of the nation’s founding and engage visitors in the history and continuing relevance of the American Revolution. Electrosonic was charged with the audiovisual design, engineering, product procurement, installation, and commissioning for the museum, which includes multiple theaters and exhibit spaces. Electrosonic was selected by Dan Bosin Associates, a project management and architectural firm representing the museum, with whom they had worked on the Edward M. Kennedy Institute in Boston. Electrosonic also partnered with M. Gitlin Co., Inc., union labor provider, and Intech, the general contractor, on the project. Visitors begin their tour of the museum in the Lenfest Meyer Theater with the 15-minute orientation film, “Revolution.” The film, shown throughout the day, explores the origins, experiences, and legacy of the American Revolution and sets the stage for the core exhibition. Electrosonic supplied three Christie HD6K-M projectors to display the edge-blended content on a 34x10-foot Stewart screen. A 7th Sense server sources the film. A complex audio system features three Tannoy VQ-100 speakers at left, right, and center, two Tannoy subwoofers, and 22 wall- and ceiling-mounted JBL 8350 speakers for an all-encompassing sound experience. Q-SYS audio control is used throughout the building. When the Lenfest Meyer Theater is not showing the main “Revolution” film, the theater can also act as a presentation and special event space. Electrosonic furnished a roll-out podium and mic, AMX touchscreen control, and a Christie DWU-851Q projector for those occasions. After viewing the orientation film visitors head up the grand staircase to begin their exploration of the origins of the American Revolution, the fight for Independence, and its legacy. 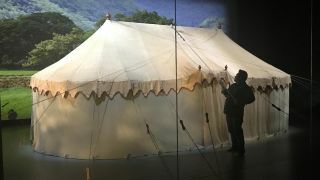 The “biggest and most challenging” exhibit for Electrosonic, according to Mayfield, is General Washington’s original sleeping and office tent, which was carefully preserved by generations of Martha Washington’s descendants and previously housed at Valley Forge. The tent is now presented as part of a unique theater experience. Visitors enter the room to watch a front-projected film on a screen that tells the story of the tent’s remarkable journey from the battlefield to the present day. When the lights slowly come up, the screen lifts to show a scrim, which becomes a new projection surface for more imagery. Then, the scrim lifts to reveal Washington’s tent housed behind protective glass. Projections show shadows in the tent, as if Washington and his colleagues were walking around inside; landscapes and weather are projected onto the back wall cyclorama. Electrosonic provided a custom Gerriets three-roller screen system, 34 feet long and made of carbon fiber, which had to fit a very tight space inside the proscenium. MetalMaster Manufacturing in Orlando designed and fabricated custom brackets to stack and offset the screens. A 7th Sense server feeds two Christie HD14KM projectors, one in front of the glass to project onto the screen and scrim and one behind the glass to project onto the back. A Christie DWX-555GS projector displays the shadow gag. Audio is delivered via Tannoy speakers, BagEnd subwoofers, and 16 JBL 8350 speakers, eight of them overhead and eight surround. MetalMaster also supplied custom speaker brackets for the tent exhibit. Interactive exhibits can be found throughout the galleries. In a “Posters of Protest” exhibit, next to a life-size reproduction of the famed Boston Liberty Tree, five side-by-side Planar monitors, in portrait mode and driven by Planar videowall processors, are fed by a custom computer with five separate outputs. Motion sensors under each monitor activate as visitors approach; visitors touch a custom PQ Labs touch overlay, with 32 active touch points, to trigger stories of key moments during the decade of resistance that led up to the war for each monitor. Electrosonic installed five 3M 32-inch multi-touch monitors in two exhibits. Three are dedicated to “Arms of Independence” and two to “Finding Freedom.” Three more Planar touchscreens, driven by Dell computers, feature in the “Season of Independence” exhibit. About halfway through the galleries is the small “Battlefield Theater,” which shows a filmed reenactment of the 1777 Battle of Brandywine at Chadds Ford, PA. Visitors walk up to a waist-high wall to view a diorama of the battlefield with a screen behind it. Two Christie DWU-851Q edge-blend projectors display the video feed from the 7th Sense server. Strobe lights, “gunpowder” smoke, and a shaking floor add 4D elements to the experience. Electrosonic installed three Tannoy screen speakers, six Tannoy surrounds, two BagEnd subwoofers, and four Aurasound floor shakers, the latter providing the feel of marching soldiers. “It’s an extremely immersive environment in a fairly small space,” Mayfield said. In the Oneida Nation Gallery visitors can stand among life-size replicas of members of the Oneida Indian Nation. Motion sensors track the visitors’ approach and stories of the intense debate—to ally with the British or join the revolutionary forces—are played back. A curved screen covering three sides of the room shows video imagery from four overhead Christie DWU-851Q projectors in one seamless, edge-blended display. Electrosonic outfitted a small circular room with three overhead Digital Projection 30sx+XB dVision projectors to show New York City crowds tearing down a giant statue of King George III on horseback, after the first public reading of the Declaration of Independence to Washington’s Army. The room’s walls serve as the projection surface. This space and the Oneida Nation Gallery use Scalable Designs Auto Alignment software on 7th Sense servers to automatically align the projectors. The final galleries are dedicated to the new republic, the birth of the Constitution and Bill of Rights, and the challenges faced by the young nation at the end of the eighteenth century. Exhibit control throughout the museum is provided by Medialon; AMX systems serve as the touchscreen interfaces. Donna Lawrence Productions and BlueCadet were the content providers. For Electrosonic, senior commissioner Tony Peugh handled all the programming, touchpanels, and interfaces for the museum; Ryan Bott is the onsite technician. Freelance engineer Dave Sirola, Electrosonic’s Andrew Kidd, and MetalMaster’s Eric Berard designed the custom brackets in Washington’s tent.